Master Bathroom Updates (Part 2) – Uniquely Yours… or Mine! 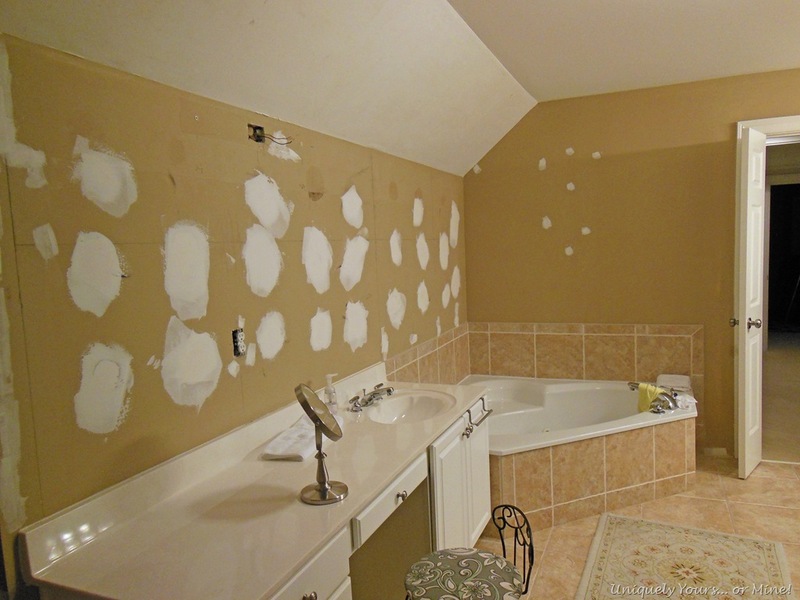 So I left you guys with the last update to the bathroom looking like this, (Click here to see part 1) and it still kind of looks like this but we’ve made some progress. Thank goodness we removed the tile as there was water leaking from the valve onto the subfloor! Obviously you can see that we were unable to remove the tile from the wall without removing the sheetrock as well. We removed the tile by first scoring the caulk and then using a pry bar and a hammer to knock out the tiles… it was pretty easy, but very loud! 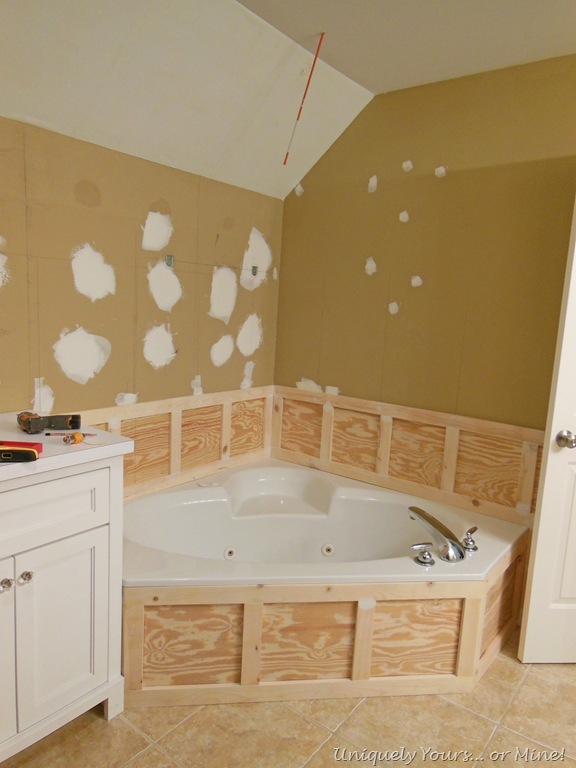 We installed this wainscoting around the tub, using a plywood backer board and pine 1×3 strips. The wainscoting around the base of the tub is wedged in but easily removable for future plumbing plans (which I have) or for repairs. I was able to convince my Super Awesome Hubby to install a junction box over the tub so that we could install a chandelier that I have had for many years but that was sitting in storage. We found the center point of the tub by using a plumb line, then drilled a hole in that spot, we then stuck a long pole through the hole so that he could find the spot through the attic insulation. Poor guy struck his head on some roofing nails while he was up there… but he got it done! I had to hang it pretty close to the ceiling, but I ‘m very happy it is there. 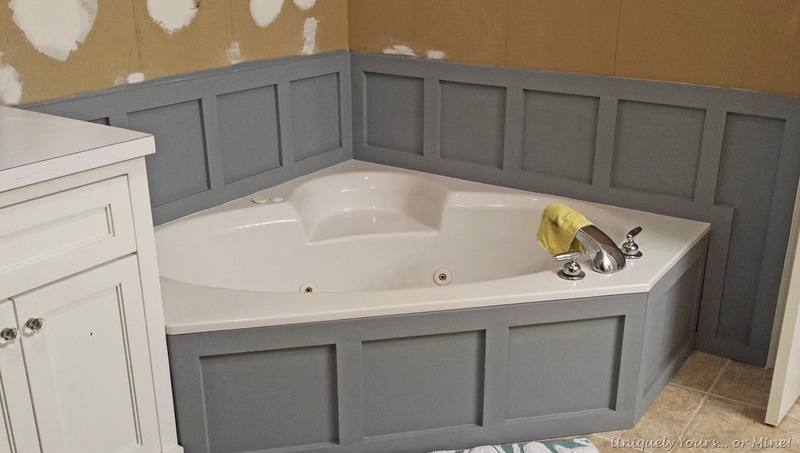 I also primed the tub wainscoting with a tinted grey primer and then caulked all of the seams. If you’re wondering I chose to prime then caulk it was to reduce the possibility of cuts or splinters from running my fingers along the wood when smoothing out the caulk. I also had had enough of this vanity! 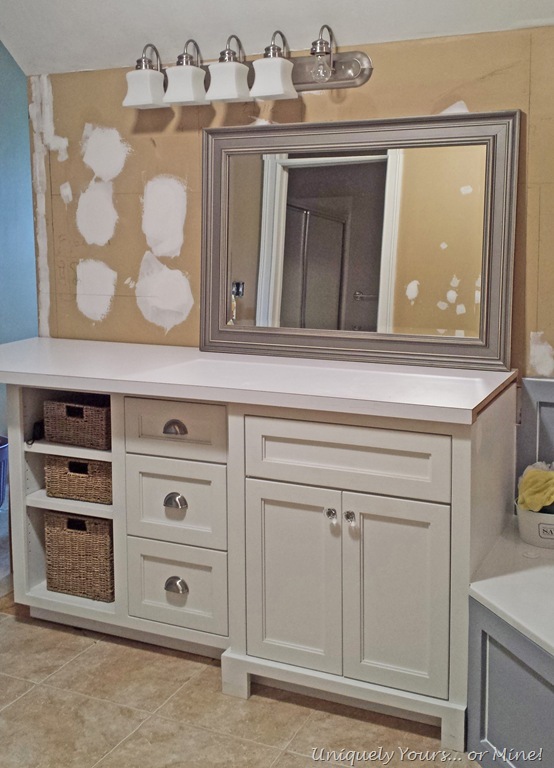 We had purchased a vanity on CL several months ago and I decided it was time we installed it. It’s installed, but I have no sink and only a temporary top (it is from the laundry room update) but at least I can use it. My Hubby still has to make a shelf like cabinet/piece for the end and I will be painting it and the tub surround a dark grey eventually. Obviously I still need a top, a sink and a faucet, but because I will need two of each of these items (because of my husband’s vanity) I’m not ready to bite that bullet quite yet. We also are still trying to decide how best to deal with installing a mirror over this area, but for now this temporary one is fine. 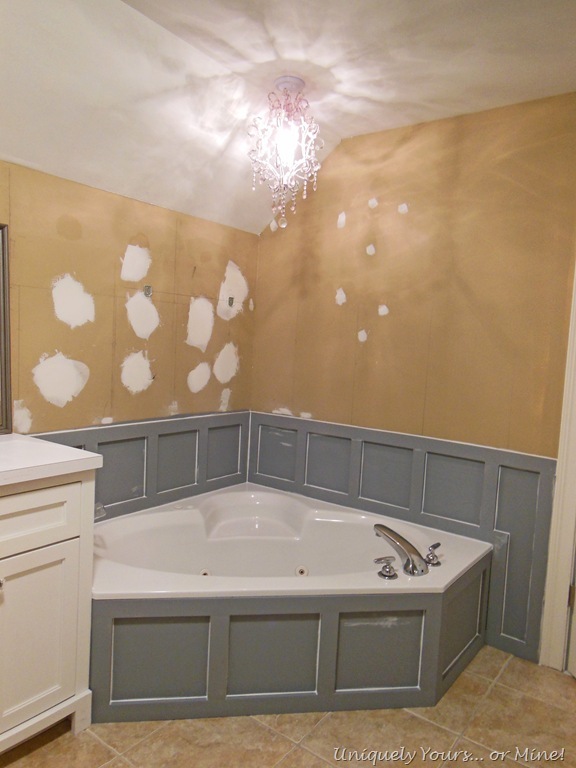 We have a lot more to do, even for just a partial bathroom update, but I’d rather live with this bathroom in a semi-state of construction than the way it was… and I am totally loving the wainscoting around the tub, I think it makes it look so much nicer! Everything is looking amazing! Your bathroom is ha-uge!! 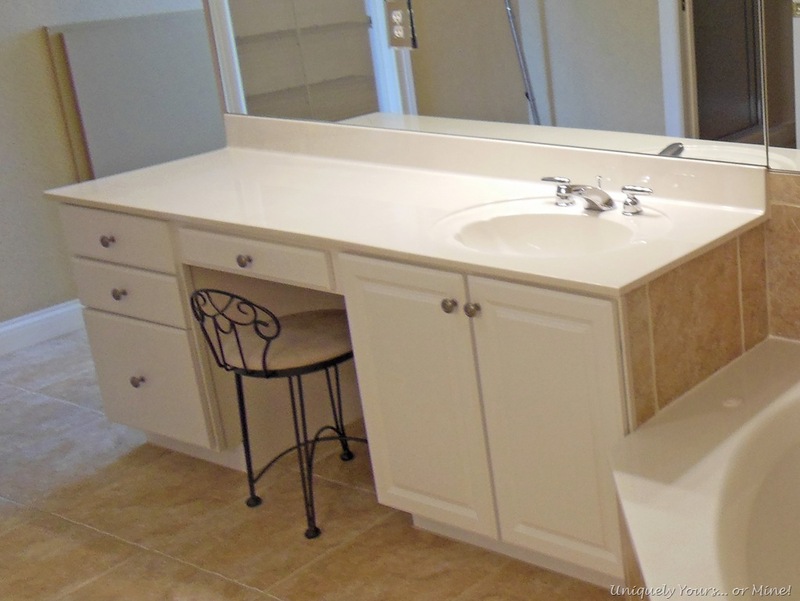 I love the chandy and the vanity…can’t believe you got the vanity on CL…..it’s perfect! 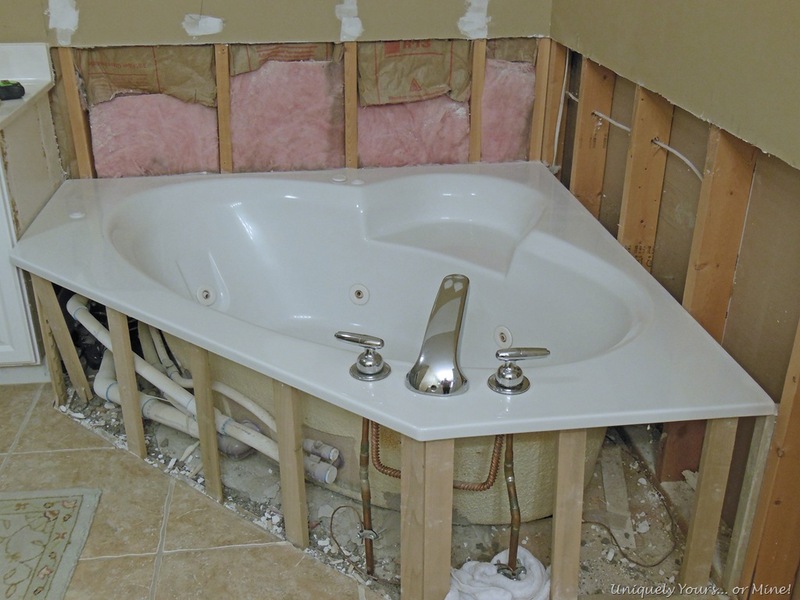 Pingback: How to Remove Tile Flooring, master bath update part 3. | Uniquely Yours... or Mine! My boyfriend and I hbe looked for three months to find something for our garden tub. This design fits wonderfully. The only thing is that I cannot twist my mind around trying to figure out how you were able to get it to look this way and flush. Did you remove the one by fours in the picture and then place with the made one by four and pine board? Or just put over/in front of the place one by fours holding the tub. 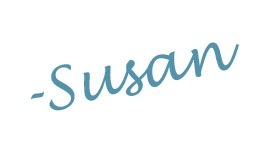 Hey Sarah, I sent you an email and a couple of pictures, hopefully they will help you! Pingback: Master Bathroom Final Reveal | Uniquely Yours... or Mine! This is a wonderful tutorial! I have a basement corner whirlpool jet/hottub bathtub that came with my house. No drywall or nothing, so after drywall is installed, I’d like to do this. It looks amazing. Thanks so much dawn! Be sure to prime the MDF or wood before painting to ensure no water gets into it, but mine is still in perfect condition. I think it looks much prettier than a tile surround myself. 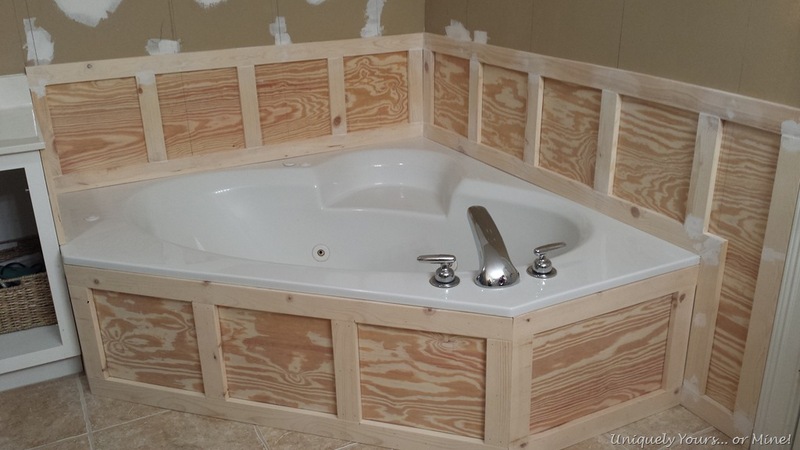 For whatever reason I didn’t have share these details, but in reviewing the posts this is what I saw/remember.. the wall behind the tub is green board (moisture resistant) Sheetrock with MDF stiles attached to it. The apron on the front of the tub was a smooth plywood (thickness was 1/2” I think) with the MDF stiles attached directly to it. The whole piece is removable for any work needed on the tub itself. Everything was painted with semi-gloss Benjamin Moore paint after all seams were caulked. Hope this helps!